Arizona Humane Society where they discovered that he had been shot. There was a wound in the left side of the dog's chest. In an x-ray bullet fragments were found in his shoulder and a bullet was lodged in his neck. Davis couldn't stop thinking about the dog she had rescued and neither could her family. Davis's ten-year-old daughter, Jessica, said that her heart broke at the sight of the torn up dog. It didn't take long for the family to decide that Elijah, as he had since been named, was meant to be a part of the family. 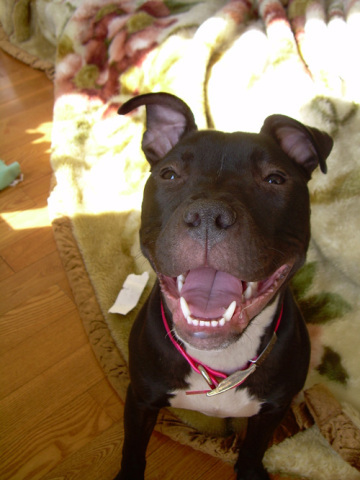 Like so many people, the Davis family was once afraid of the pit bulls after all of the bad press the breed had gotten. They took Elijah into their home as a foster animal even though for months vets were unsure whether Elijah would actually be able to recover from his wounds. It looked like he might even lose a leg. The road to recovery will come to an end today when the Davis family formally adopts Elijah and he becomes a part of their family forever. He may not be a cat, but Elijah is one dog who managed to land on his feet.